The portrait of George Washington is based on a stipple engraving by Edward Savage. In late 1789 to early 1790 Washington sat on a number of occasions for a portrait to be painted in oil on canvas by Edward Savage for Harvard University. He is depicted in uniform with the badge of the Society of the Cincinnati on his lapel. In 1791 Savage went to London where he stipple engraved and published a print after his own painting of Washington. The print is inscribed Painted & Engraved by E Savage. George Washington Esqr. President of the United States of America. From the Original Picture Painted in 1790 for the Philsosophical Chamber at the University of Cambridge in Massachusetts. Published Feby. 7, 1792 by E Savage, No.29 Charles Street, Middx. Hospital. 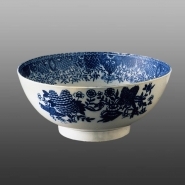 The exterior of the footed punch bowl printed in a Chinoiserie type floral design. A footed earthenware punch bowl printed in blue. The interior is printed with a portrait of Washington and the inscription beneath the medallion GEORGE WASHINGTON ESQR./ President framed with a wide Chinoiserie border.